Builders! The Building-Building Deck Building Game. Even before it reached me, I knighted this as among my favorite titles for a game yet! It just has fun built right into the name, you know? And the presentation and gameplay that followed only bolstered my affection for the card game. I thought it only appropriate to review this game in the order in which impressions were made. 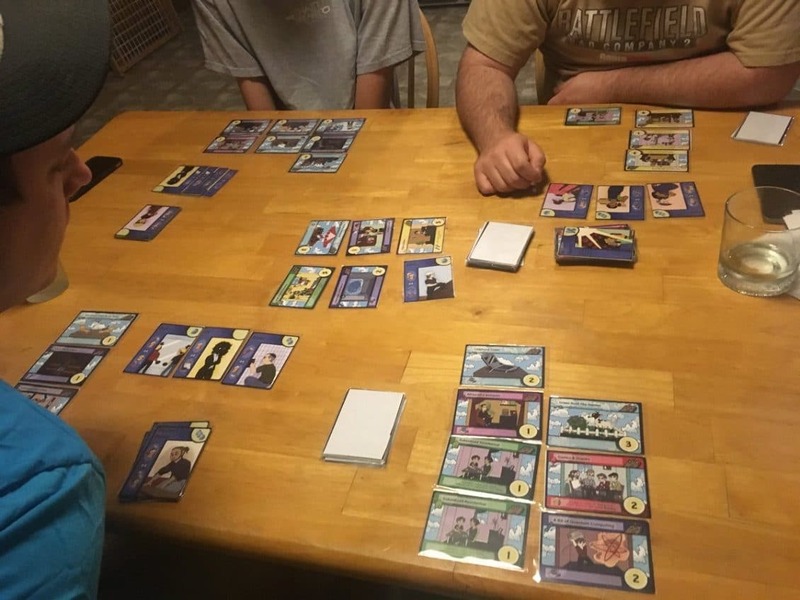 Before my Wednesday night gaming posse arrived to my home, I went ahead and shuffled the Contract Deck, drew the Available Contracts, and had each player’s starting hand ready to go. Both are spot on. The cartoonish remark was not a knock on the aesthetics whatsoever. The Laborer cards depict people at work; nothing too silly here. 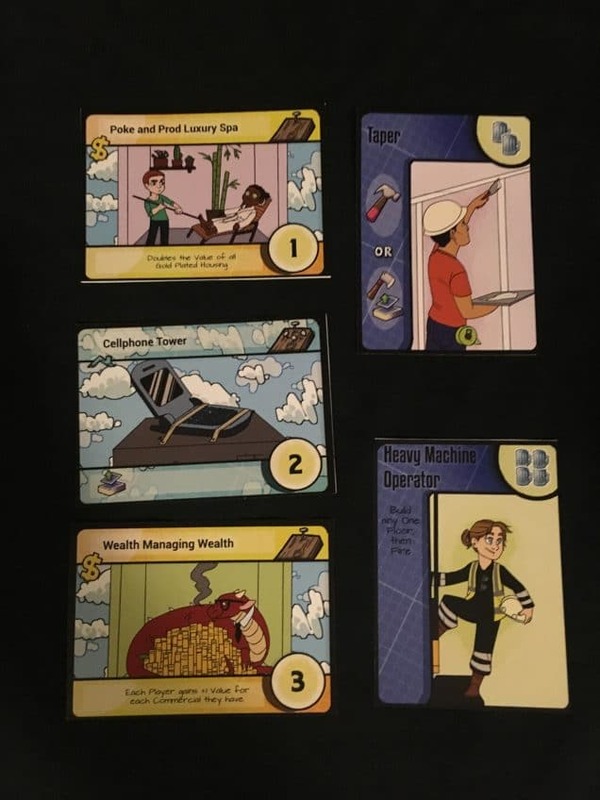 The Building cards, on the other hand, often have the kind of fun only cartoons can have: Goofy literalisms like Cellphone Towers paired with fantasy concepts like dragons as bankers and goblins as behind the scenes tinkerers. And as the second comment pointed out: The art is extremely diverse when it comes to race and gender as well as with perceived gender roles. When you think of construction (the major theme of the game), you tend to think of dudes. But every winning set of employees is going to be diverse. Period. The iconography of the cards is also super consistent, making it easy to follow. All costs are in the top right and all resources are on the left. Even though the Laborer cards and Building cards are oriented differently (portrait vs landscape, respectively), you know exactly where to look for the relevant information. The gameplay is also extraordinarily simple. It took me less than 3 minutes to explain all of the symbols, how they’re used, and what a turn looks like. We were playing this game faster than any other that I can recall, and there is something to be said for that. In the end, we all agreed that Builders! would be a fantastic first taste of deck builders; one that anyone could pick up with ease, regardless of their gaming experience. In typical deck builder fashion, any Laborers hired go into your discard pile to be drawn into your hand on a later turn. You also have means of thinning your deck a bit as the game progresses to ensure higher quality draws than your starting deck allows. Many Laborers provide a choice between two sets of resources, and some even allow you to draw extra cards into your hand (thereby granting you even more resources for that turn). I did wish the game included some sort of small token for covering up resources as they were spent – particularly later in the game when I was handling as many as 7 or 8 cards and trying to stay honest with them! But this is an easy fix: Grab some pennies or some other small bauble if you need to. Your opponents can always decide to use their Axes to tear down the topmost floor of any of your buildings that do not have a roof. If the Inspector card makes its way into the Available Contracts, all buildings without a roof on them come under her scrutiny! If any of the buildings in your Plaza have cards with a higher cost above any with a lower cost, she is going to tear them down – starting at the top and working her way to the ground floor until the building passes inspection. So there is a cutthroat element to the game as well as a risk element. You certainly can cheat the system, but if you’re caught you may end up paying dearly! The game end trigger varies based on the number of people playing, but everyone gets one more turn afterwards to try and get their Plaza in shipshape for the highest score possible. Each Building card has a Value in the bottom right hand corner, and each gets additional points based on where in your building it is (3 extra points for a third floor, 2 for the second, etc). Many of them also have modifiers that may change their Value based upon floors in the same building, your other buildings, or even all of the Plazas in play. So paying attention to the flavor text of your floors as well as your opponents’s floors is a wise call! Builders! is a downright good game. It is an ideal entry point for deck builders as a genre, and literally anyone can pick it up and play it successfully inside of 5 minutes. It also eats up much less space than most deck builders do and plays in no time, making it a go-anywhere game. 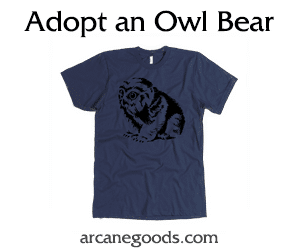 It is currently on Kickstarter and I cannot recommend it highly enough. There is much, much fun to be had racing to build your skyscrapers while sabotaging the efforts of your competitors! It is not the most complex deck builder out there, but that does not mean it is neither well engineered or nor entertaining. On the contrary, its simplicity is a significant part of what makes it excellent. Embrace its simplicity and fun! Disclaimer: Broken Things sent Nerds on Earth a prototype of Builders! for review purposes. 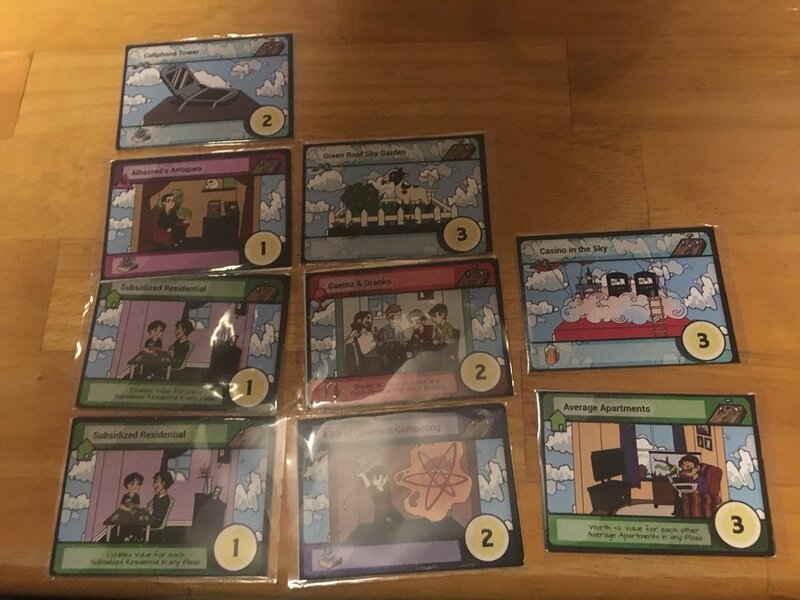 The production of the game components featured in this post do not necessarily reflect those of the final product upon funding on Kickstarter.